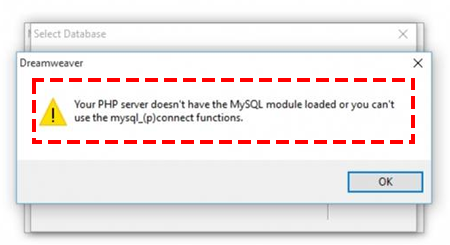 "Your PHP server doesn't have the MySQL module loaded or you can't use the mysql_(p)connect functions." MySQLi Database Connector DwThai.Com The MySQLi Database Connector Dreamweaver Extension, Server Behaviors Panel for Dreamweaver CC https://mysqli.dwthai.com/img/mysqli-dreamweaver-share.png , Rating: 4.6/5 จำนวน 556.
note: ใช้ได้กับระบบ MS Windows เท่านั้น. หากท่านเลือก Download แล้วนำไปติดตั้งไม่สัมพันธ์กับ Dreamweaver ของท่าน จะไม่สามารถติดตั้งหรือไม่สามารถใช้งานได้. If you choose to download and install that does not match the Dreamweaver version, your program will not be able to install or can not be used.